Numerous of stone is applicable for lamiantion, including marble, granite, limestone, sandstone, travertine, onyx etc. With its unique advantages, stone honeycomb panels better fulfill design intent, saving significant material cost and installation time. Customized epoxy adhesive supplied by world renowned adhesive brand. Accelerated aging tests approved. 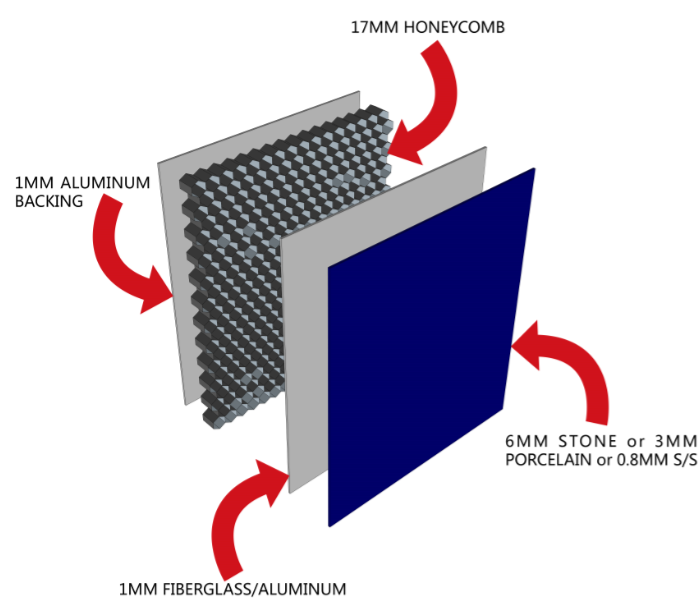 The major concerns on stone honeycomb panels focus on the durability and weather resistance. Amongst various factors the key point is what adhesive being applied for lamination, which detemines the life span of the panels. HyCOMB® has been cooperating with world renowned adhesive manufacturer and applying epoxy adhesive which taylor-made specifically for lamination of stone and aluminium / fiberglass. Detail guildlines of how to apply adhesive appropriately also instructed by the adhesive manufacturer, which have been strictly follow during the production of HyCOMB® stone honeycomb panels. Boiling water test will be carried out randomly to make sure our panels being integrated under temperature of 100 degree celcius lasting for two hours. Accelerated aging test also conducted via SGS: -40 degree celcius to 80 degree celcius then back to -40 as one cycle. A total 60 cycles onward. The bonding strength remains at an excellent level.